A mother has given birth to the world's biggest baby girl - who weighs the same as an average six-month-old. 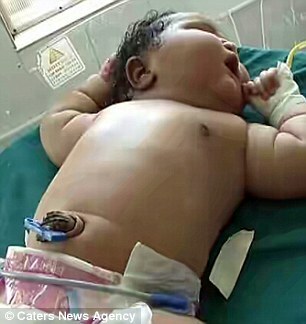 The unnamed baby was born by Caesarean section on Monday weighing a staggering 15lbs. Her 19-year-old mother, known only as Nandini, was astonished by the size of her first child when she was born in southern India. She tipped the scales at twice the size of an average baby, which typically weigh about 7lb 5oz. And it is believed her birth overtakes the current record holder, Carisa Rusack, who was born weighing 14lb 5oz in Massachusetts in 2014. 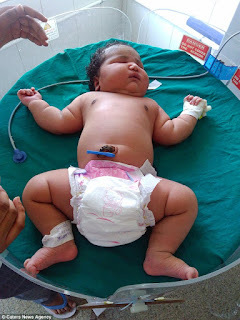 Dr Venkatesh Raju, the local health officer, said: 'In my 25 years of experience, I had never seen such a big baby. The girl, who has not yet been named, surprised both family and medics by her enormity. 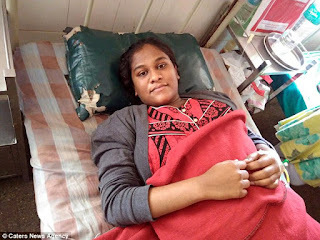 Nandini, who herself weighs 14.5 stone (94kg) and is 5'9 tall, had a smooth pregnancy throughout but was unaware she was about to give birth to a big baby. While her size hinted at high sugar levels, doctors confirmed that she is not diabetic which usually causes obesity in new-born infants. The baby is being kept at the neonatal intensive care unit and doctors are monitoring her developments before they discharge her in few days.